Stop by our Anchorage Toyota dealership today and get started on applying for approved Toyota financing! We are your nearby Toyota dealership providing new Toyota cars and excellent automotive services to the local Anchorage area and beyond. As part of a family owned and operated business, we extend our values of unparalleled customer service to every individual that we welcome through our front door. It’s the Kendall family difference and we would love to welcome you home to Kendall and help you find the perfect Toyota for your driveway and for the road ahead. Visit our Toyota showroom today and test drive one of our new Toyota cars. Our new and certified Toyota dealership is conveniently located at 6930 Old Seward Highway in Anchorage, Alaska 99518 and we are only a short drive away from the surrounding communities of Wasilla, Palmer, Eagle River, and Kenai. You’ll love the new Toyota Camry, Toyota RAV4, Toyota Tundra, Toyota Highlander, as well as many more Toyota models to choose from. For our customers looking for a new vehicle, our friendly and knowledgeable staff is happy to sit down to help you find a new Toyota that is right for you. Browse our inventory of new Toyota cars, trucks, and SUVs to see the exciting new features and upgrades available on these award-winning vehicles known for durability and longevity. Kendall Toyota of Anchorage understands that not everyone is looking for a new Toyota. That’s why you will not only find new Toyota vehicles, but a wide variety of used cars from your Anchorage Toyota dealer as well. Our large inventory of Toyota used cars provides our customers looking to make an automotive purchase with many used car options. Furthermore, in our selection of used cars in Anchorage we have an inventory of Certified Pre-Owned Toyota cars. To ensure top quality, our certified Toyota cars have gone through several tests and multiple-point inspections. Shop our used car inventory, then give us a call or contact us online if you have any questions. We also offer our Kendall Auto Protection plan on all qualified used vehicles. This coverage is unheard of at other Anchorage used car dealerships and offers extensive auto coverage that includes your engine, transmission, and drive-train system. It’s the ultimate in peace of mind and we’re happy to offer it to our customers because going the extra mile is simply what we do here at Kendall Toyota of Anchorage. When the time comes for a routine service such as an oil change or tire rotation, we recommend you talk to our Toyota Service Center. Not only can our team assist you with those routine check-ups, but they can also take care of hefty repairs and part replacements. We also cater to our do-it-yourself customers with our Toyota Parts Center that offers a wide inventory of certified Toyota parts and accessories fit for any of the Toyota models that are available at our Toyota dealership. Don’t wait! 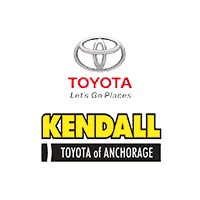 Schedule a service appointment with Kendall Toyota of Anchorage today! Thank you for being our neighbor and customer and helping to make Anchorage the beautiful place that we are so thankful to call home. From our family to yours, welcome home to Kendall Toyota of Anchorage. We hope to see you soon.